Supporting participants in our year-long Young Leaders Access Program, our YLA mentors help young leaders from around the world develop into leaders of positive change in their communities. It’s an enormously rewarding opportunity that helps alumni continue with their own leadership growth, work with internationally- and culturally- diverse teams, and connect with fellow alumni from around the world, as well as the MCW Global community. Participation as a mentor, however, entails a commitment of time and effort, so please consider applying only if you are prepared to contribute meaningfully. 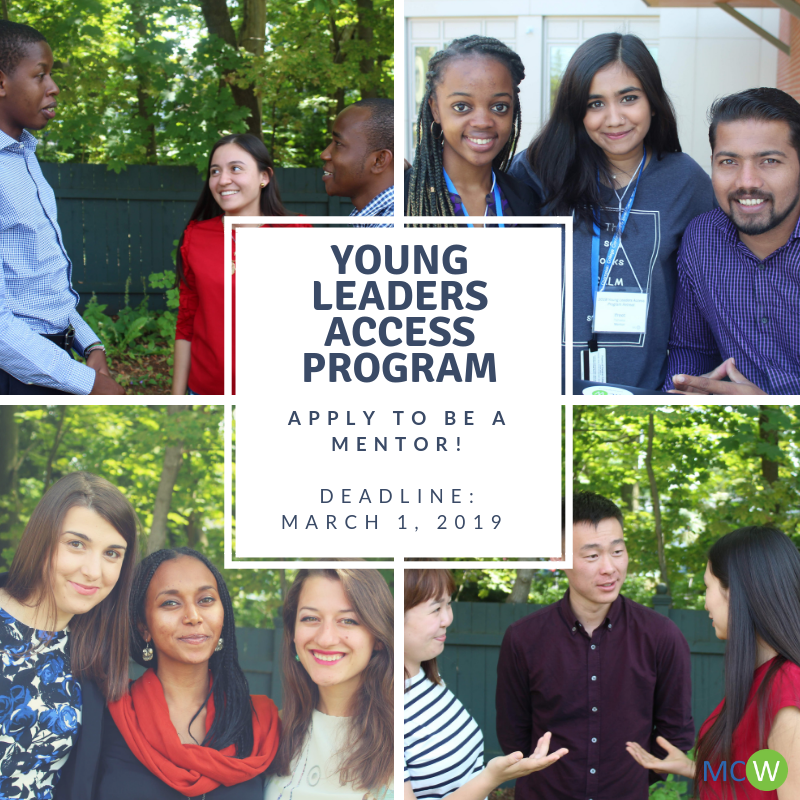 Now in its 22nd edition, our year-long Young Leaders Access Program is for participants from around the world (18 to 26), who want to become leaders of positive change in their communities. It is our mentors, returning YLA participants, who help facilitate this process. The mentorship part of the program is based on 2 phases: (1) The Summer Retreat, including Mentor Training; and (2) Ongoing Vision Planning and Project Development. The Young Leaders Access Program begins with an intensive summer retreat that focuses on leadership development, global citizenship, and how to develop a project from beginning to end. Mentors play a crucial role in the success of the retreat as they lead sessions and activities, monitor and evaluate the work of the mentees, and help build group cohesion. Mentors are also paired with mentee(s), helping guide them through the process of creating a viable vision plan. The retreat (July 23 to August 1) begins with mentor training (July 21-22). During the training, mentors explore the methods and tools behind vision planning, team building and cultural competency. The mentees arrive on July 22, and the retreat begins on July 23, when everyone travels together from New York City to Burlington, Vermont. On July 31, everyone returns to New York City for the Open Doors Closing Ceremony in the early evening. During the year, mentors continue to provide mentees with guidance and support on the development of their vision plans by facilitating quarterly “hangouts,” in addition to ongoing remote communication, in which mentors check in on the status of their mentees’ vision plans, share inspirational ideas and stories, and address any questions that arise along the way. Mentors are supported throughout the process by Co-Lead Mentors and the MCW Global team by participating in quarterly “hangouts” and ongoing remote communication. Be a graduate of the Young Leaders Access Program or a pre-2016 Youth Leadership Retreat (Mentees of the 2018 YLA are eligible to apply). Maintain timely communications and engagement with the MCW Global team. Demonstrate efforts to further develop their vision plan, in part or in whole, and to share lessons learned from the process. Have access to email or other internet communication platforms (e.g. WhatsApp, Facebook, and SKYPE) that support regular communication with Co-Lead Mentors, the MCW Global team, and mentees. Commit to attending the full Summer Retreat, including Mentor Training (July 21, 2019 – August 1, 2019) and providing ongoing Vision Planning and Project Development Support during the year-long program (August 2019-July 2020). Be eligible for appropriate visa and travel documentation. Submit a complete application by March 1, 2019. Subway transportation to and from NYC-area airport (LGA, JFK, EWR) to New York University (with proof of purchase/receipt). Ground Taxis (Yellow Cab, Uber, Lyft, etc.) will not be covered. Expenses for the duration of the Mentor Training and Summer Retreat (July 20, 2019 – August 1, 2019), including housing, food, travel, and materials. for this year’s Young Leaders Access Program? If you were a mentor at a past Young Leaders Access Program or a pre-2016 Youth Leadership Retreat you are eligible to apply. Co-lead quarterly mentor hangouts with mentors and MCW Global team members.